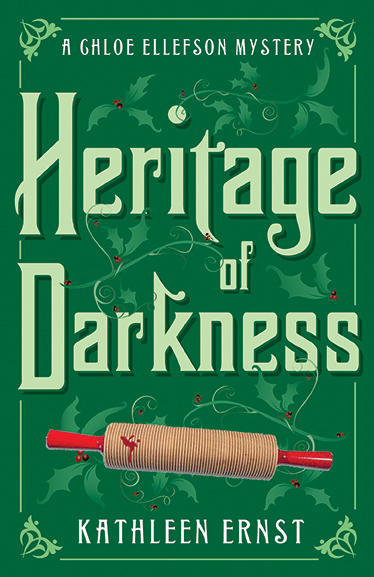 Since a lefse pin spattered with blood is on the cover of my latest Chloe Ellefson mystery, Heritage of Darkness, it’s not much of a spoiler to say that the murder weapon is. . . you guessed it, a lefse pin. Which has led some readers to ask, What the heck is lefse, anyway? Lefse is a round flatbread usually made with mashed potatoes (which used up old potatoes, and kept the bread soft) and baked on stovetop or griddle. It was a staple in the diet rural Norwegians and Norwegian-Americans in the 19th century. 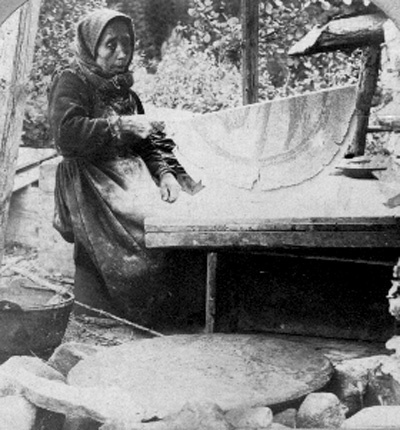 This old stereocard image shows a Norwegian woman making lefse on an outdoor griddle. A lefse stick is used to turn the paper-thin round of dough. 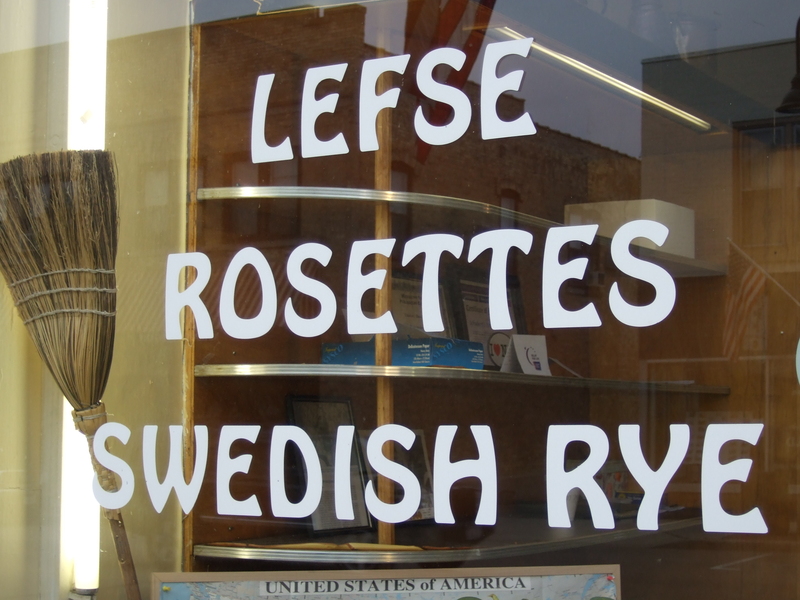 I was introduced to lefse when I worked at Old World Wisconsin. 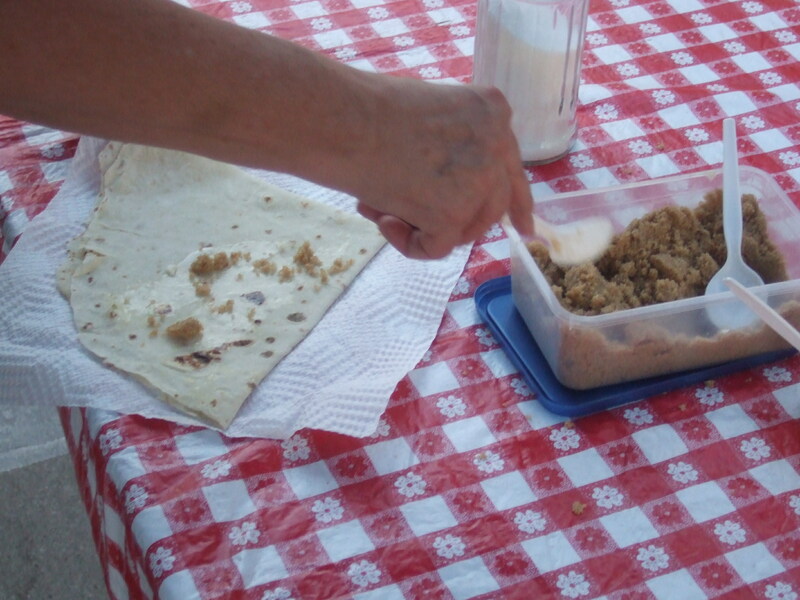 Lefse was frequently made at the Fossebrekke cabin, home to young Norwegian immigrants. 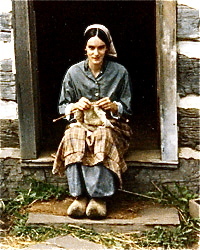 That’s me at the 1845 Fossebrekke cabin in 1982. 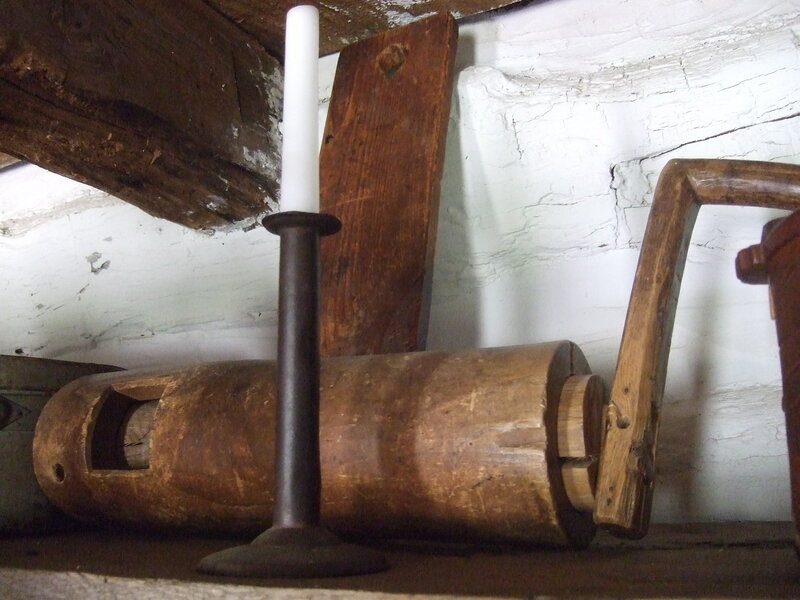 Hand-cranked potato masher, Fossebrekke cabin, Old World Wisconsin. 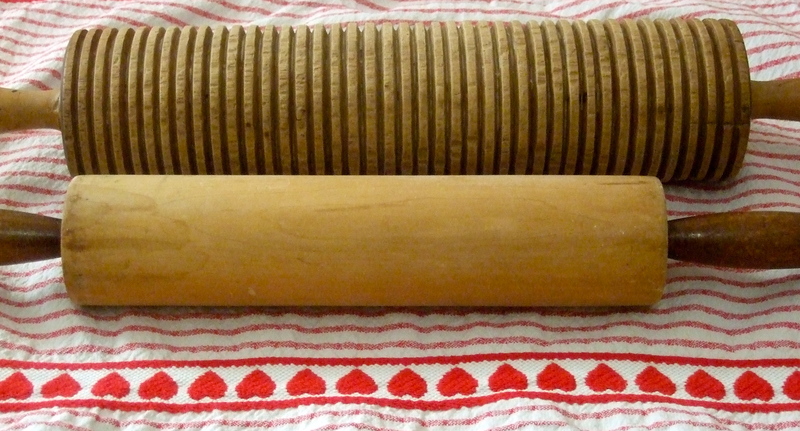 The heavy wooden pins used to roll the dough were deeply scored or grooved, which helped reduce air bubbles, pulverize any bits of unmashed potato, and keep the rounds of lefse quite thin and pliable. Two pins on exhibit at Vesterheim Norwegian-American Museum. In Norwegian-American communities it can still be found in local stores. . .
Schubert’s Diner and Bakery in Mount Horeb, WI. . . .often folded into quarters and offered fresh or frozen. Although fewer and fewer people make lefse at home, it still holds a special place in good Norwegian-American hearts. Many people have memories of mom or grandma boiling Russet potatoes and making lefse on special occasions. 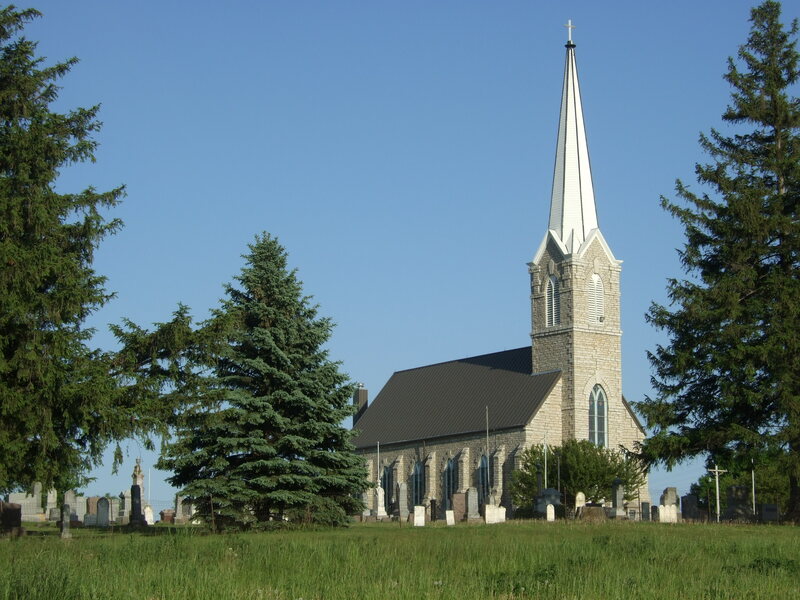 On the way, she told me that when the church needed a new roof, several elderly members of the congregation made hundreds of lefse. They announced sales, to be held at a bank in town. Sales were brisk, and the money raised helped buy the new roof. 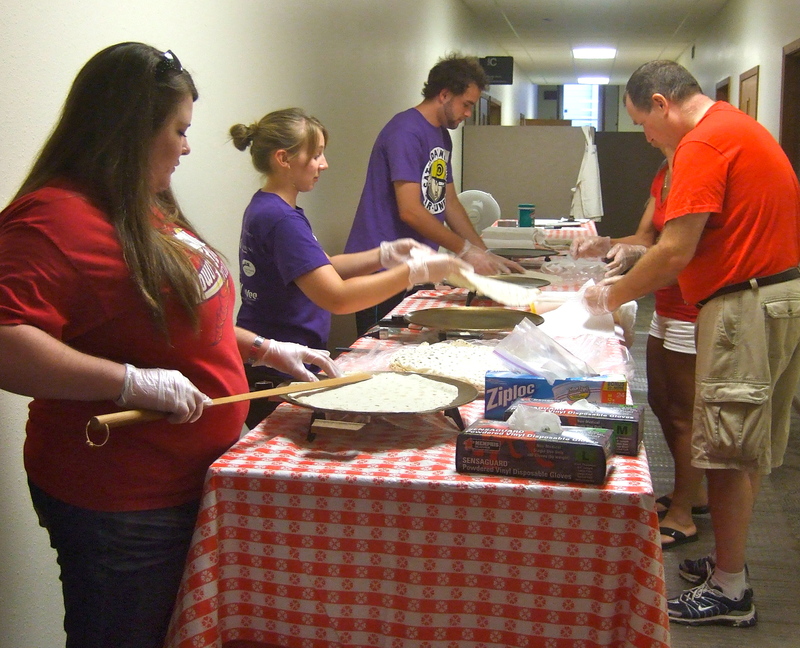 A few weeks later at Nordic Fest, a celebration of Scandinavian heritage and pride held in Decorah each summer, another small army of lefse bakers reported for duty. 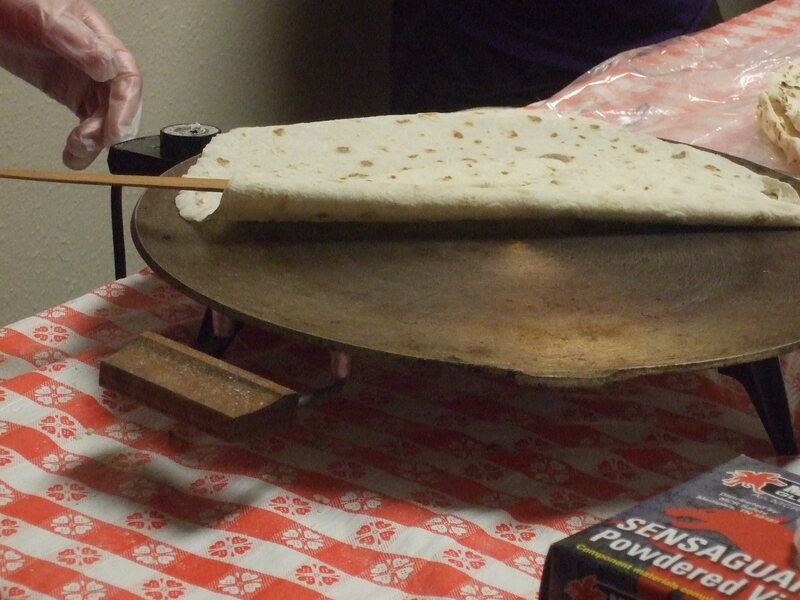 Warm rounds of lefse are delivered from the griddle to eager buyers, who add whatever toppings they prefer. I’ve read that 10,000 lefse are served at Nordic Fest each year. Me, I love lefse spread with butter and brown sugar, then rolled up tight. Maybe a touch of cinnamon. Or lingonberry jam. Decades ago, I bought a lefse pin at an antique store. I don’t know how old it is, or who used it, but I liked to wonder. Who once used it to roll out a bit of home or heritage on a flour-dusted table? My lefse pin is much larger than my regular rolling pin. Heavier, too. And one year, while working at Old World Wisconsin, the Norwegian-area interpreters gave me this lovely rosemaled lefse pin at the end of the season. While I treasure the stick, I must admit that I’ve never made lefse at home. After learning how on an antique stove in an 1845 cabin, it just wouldn’t feel the same. This stick has had a place of honor in my kitchen for 25 years. 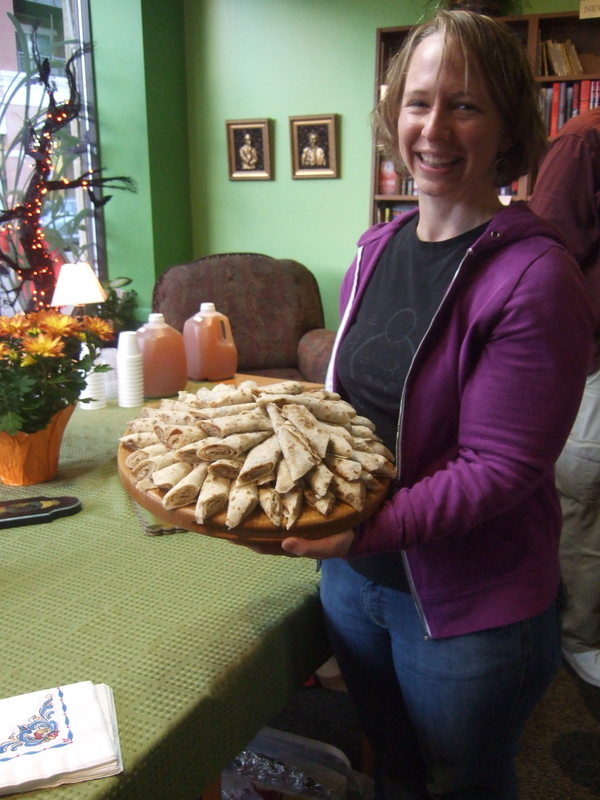 At the launch party for Heritage of Darkness held at Mystery To Me (in Madison, WI) I witnessed lefse’s popularity all over again. My talented baker friend Alisha brought a gorgeous cake. She also brought a plate of lefse made by Lutheran church ladies, and rolled up with butter and cinnamon and sugar—the combination she’d learned from her Norwegian grandmother. 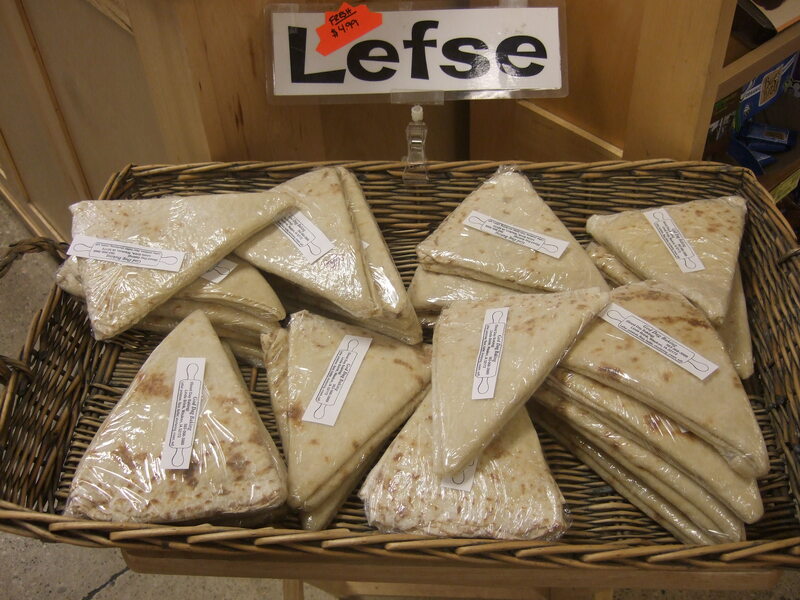 People who’d never tried lefse were eager for a sample. People who had their own fond memories of lefse munched happily, reminiscing. This plate of lefse disappeared fast. Really fast. I think the generations of long-gone lefse makers would be pleased.